"If the camera was moved between filming these two frames, the sign could shift left and right, or up and down, compared to the background. In other words, the orange lines could shift sideways compared to the blue lines. But the angles cannot change, like they do here. It violates the laws of physics. It is a forgery." "But there are two things that don't match up properly. One is the road sign, which comes out blurry. This is because it was pasted into the film incorrectly, as described on the last page. If you look at the white wall and the bushes in the background, you can see that the two panoramic views line up exactly. But the lamppost changes its angle. The Zapruder film shows the lamppost leaning slightly to the right. Even though it is only a small lean, it is something that could not happen if the film was genuine. 'Moving the camera around' obviously changes the objects in the image, and in particular which objects are obscured by others. 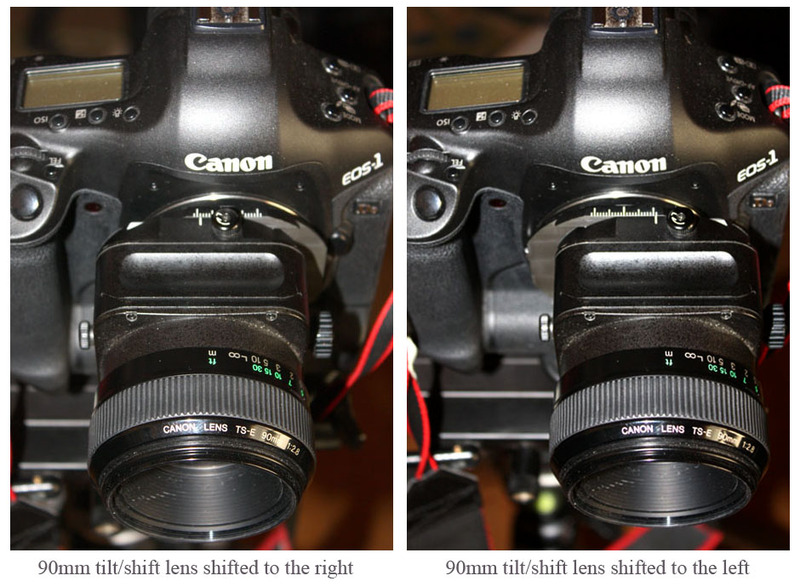 Shifting the camera left-right or up-down (or any combination of the two) by small amounts shifts image objects, depending on their distance from the camera. This is called 'parallax' and Lamson can read about it in optics or graphics text. A simplified argument to understand what is going on here is to realize that if you hold a camera perfectly horizontal, then a vertical pole will be vertical in the image no matter where you put the camera. The mathematical subtlety comes in catering for the fact that a camera need not be held horizontal, either left-right or up-down. This is where the transformations referred to bring everything to a common basis, where the optical axis is horizontal and the image orientation is horizontal, by calibrating against the background objects in Dealey Plaza (which, being distant, are affected negligibly by the small movement of the camera location). I have not received any requests from Lamson for clarification of this point, probably because he has been blocked from my email for years due to harassment. I am sorry that he has remained confused and confounded on this issue for so long. I hope he can do the homework necessary to enlighten himself. I have wasted many hours on his harebrained requests in years past, and am not inclined to throw away more time on him. If anyone wishes to believe his rantings, then by all means let them. It's a free country. So if we summarize Costella's statements they are quite clear. vertical in the image no matter where you put the camera"
There is no ambiguity in Costella's statements. And after all he has a PhD in Physics, so he speaks from a position of authority. But a question remains, is he correct? When confronted that his statement cannot be true in the real world and asked to provide empirical proof of concept, Costella runs away. That in itself is not unusual for Costella and it's not the first time he has failed to do some simple photographic tests to see if his opinions play out in the real world. But real world empirical testing is part of science. One must question why Costella does his best to stay away from it. I can only surmise it to be fear of admitting failure. To find out if Costella is correct I decided to do some empirical testing. Can the angle of vertical pole change if we move the camera? First we have to ask, what is a vertical pole? 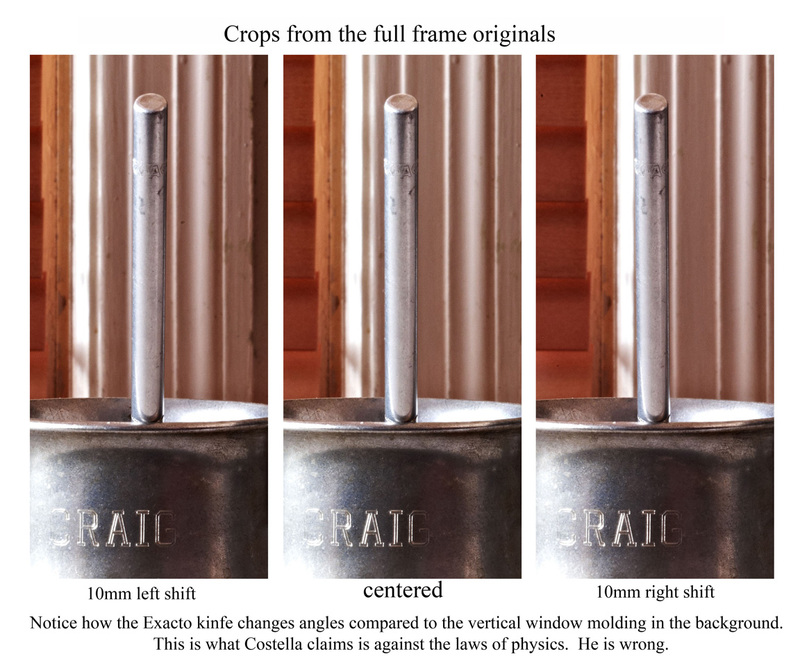 If we answer that it is a pole that is perfectly vertical and truly plumb then Costella is correct, that pole will not change angles as the camera is held perfectly horizontal no matter where you put the camera. So far so good for the Doctor. But what happens if the pole is not vertical and perfectly plumb? Does his theory still hold? The answer is a resounding no! Let's consider that leaning pole. In real life a leaning pole an appears exactly vertical when viewed for two points, one where the pole is leaning directly towards you and one when it leans directly away from you. Viewed from any other position the pole will be at varying angles from vertical depending on your viewing position. This is quite easy to test in real life by simply walking around a leaning pole and viewing the changes in angle. All of this begs the question, were the poles Costella uses in his study of the Zapruder film vertical in all axis or were they leaning? The photographic evidence says they were leaning. But does all of this translate to actual photographs. Again contrary to Costella's claim, yes it does! To illustrate the fact that the angle of a vertical pole can change when the camera is moved I created a simple test. I used a Canon 1DsMKIII camera, a tripod, a Bogen 303Plus Pano head, a 90mm Canon Ts-e lens, an Exacto knife in a cup and window molding as a background. For this test I placed the cup with the Exacto knife about an equal distance from the camera and the window in the background. The camera was leveled. The Exacto knife was placed in the cup in such a manner that the top of the handle was angled towards the camera and so it appeared vertical in the camera. The 90mm Ts-e lens ( http://www.usa.canon.com/consumer/controller?act=ModelInfoAct&fcategoryid=156&modelid=7329#ModelDetailAct ) was chosen for two reasons, it allow for shifting the lens side to side by 10mm in each direction and it is highly corrected for distortion so no transforming of barrel or pincushion is needed, The actual camera never moved during the test. Only the lens was moved a total of 20mm from side to side. I took three photos of the Exacto knife in the cup, one with the lens centered, one with it shifted 10mm to the right and one with the lens shifted 10mm to the left. Careful examination shows that the Exacto knife changes angles as the lens is shifted right and left. Costella says this is impossible and against the laws of physics. Sadly, for him, empirical testing shows he is wrong. I have created this animation using the right shift photo and the left shift photo to show graphically the changes of angles between the two images. Clearly John Costella is wrong. The very bedrock of his claims has been shown to be false. The empirical proof is unimpeachable. It is the process called parallax and Costella can read about it in optics or graphics text. I've wasted far too much time dealing with Costella's harebrained ideas and finally this sorry chapter of Costella's mistake is to rest. However if someone insists on believing his rantings, be my guest, after all it's a free country. By the way, you don't have to take my word on this, like Costella expects you to do with his claims. That's the wonder of empirical testing, it can be repeated. I urge you to do your own tests and reach your own conclusions.